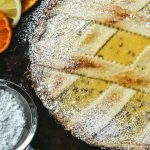 I came across this recipe a few years ago and it was instantly a hit (minus the mangos)! I brought it to every party. I made it here for the kids every couple weeks. Everyone loved it. And then sadly, the little Upside-Down Plum Cake recipe was tossed aside like a pair of dirty socks in a corner. My kids got older and smarter and started making requests in my little kitchen. I thought of a way to sneak it back into my baking repertoire: add mangos! I know, I should have added chocolate and then this cake would become a permanent hit. Somehow, mangos seemed to be the more appropriate addition. And it was! This will possibly be the last time I brag about my mangos. 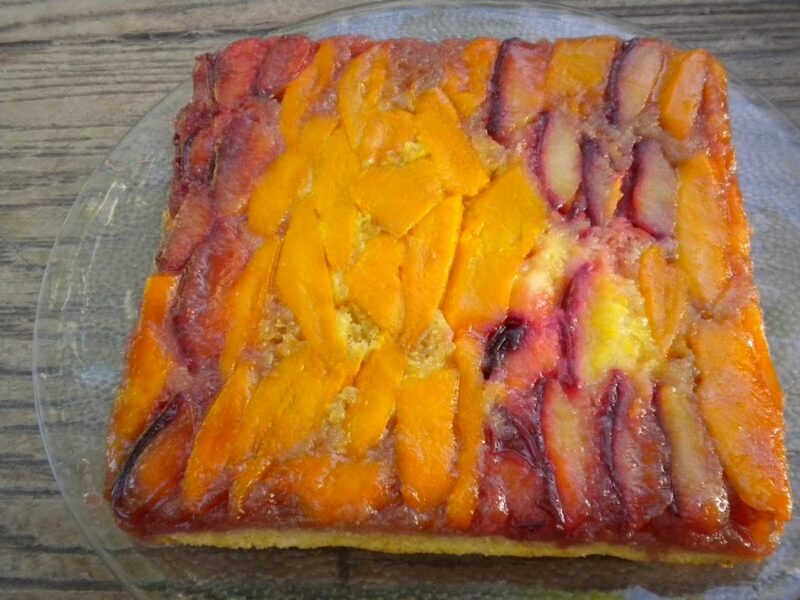 You could make the cake the way I first did by omitting the mangos and adding a few more plums. 1. Preheat oven to 350 F. Place 4 tablespoons of butter in an 8 inch square cake pan. Heat in oven until butter melts, about 4 minutes. Remove from oven; sprinkle brown sugar evenly over butter. 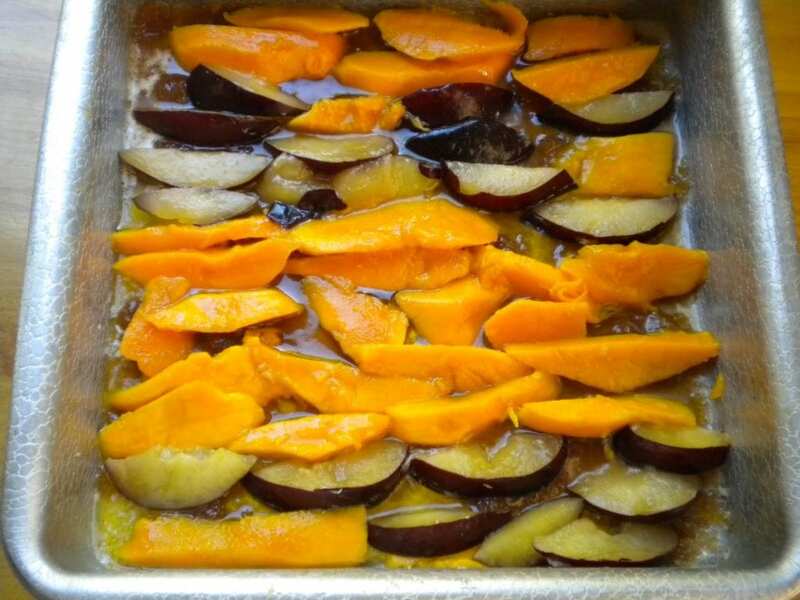 Arrange plum and mango slices in staggered overlapping rows, covering bottom of pan evenly. 2. In a large bowl, cream remaining 8 tablespoons of butter with sugar and lemon zest. 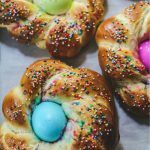 Add eggs, one at a time, beating until combined after each. 3. In a medium bowl, whisk together the cake flour, baking powder, salt, and allspice (or cinnamon). Add flour mixture to butter mixture in three batches., alternating with the milk and starting and ending with the flour. 4. Pour batter into cake pan, and spread evenly over plums. Bake until a toothpick inserted in center of cake comes out clean, about 50 minutes (my oven was about 40 minutes). Let cool 10 minutes, then invert cake onto wire rack (or onto your serving dish)to cool again slightly before serving. (I don’t like the cooling on rack part. It is so much easier to invert directly to your serving plate-sorry Martha). Here is how I arranged my fruit. This is not baking perfection. I was rushing to go to a dinner party. The mangos were super slippery and my plum sizes super tiny. I made it work and it looked beautiful in the end. So don’t be intimidated about how it should look. In the end, it was very pretty. And delicious! Thanks for the compliment for my no bake raspberry cheesecake. 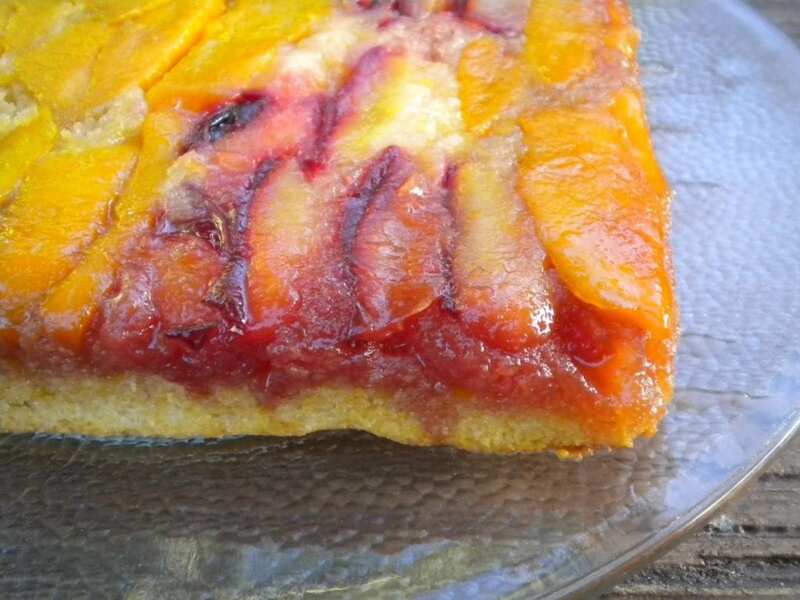 Tasted your mango plum upside down cake, and it was amazing! Cannot compare the actual color to the photo, so vibrant and beautiful. I love just about any type of upside down cake, the buttery gooey flavours……your looks so good! 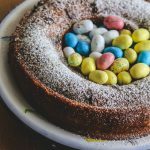 I have never used either of those fruits in a cake and they sound delicious! 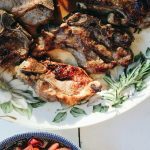 thanks so much for sharing this recipe, and I hope you are enjoying this wonderful labor day weekend! I love upside down cake but have never had a mango one. Great idea!